The fact that there is a Thomas Jefferson Ice Cream Recipe comes as a surprise to most people. 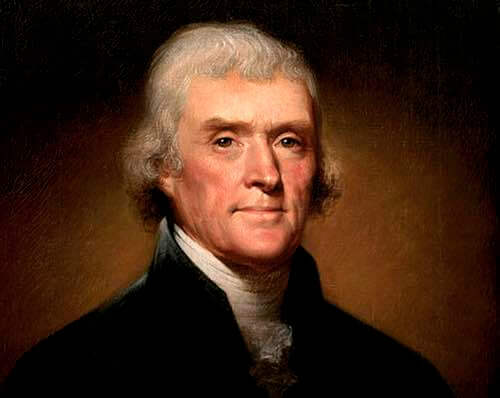 Did you know that Thomas Jefferson returned to America from his stint as ambassador to Paris in 1789, with a handwritten recipe for French vanilla ice cream and his own ice cream making equipment? Not long afterwards, Jefferson had a special ice-house built at Monticello so he could indulge in making ice cream and freezing desserts the year-round. He often served his distinctive frozen treats to favored guests at Monticello. The flavor Thomas Jefferson most loved to eat was old fashioned French vanilla and on at least one occasion he had a special order of vanilla bean pods sent to him from Paris. He was a serious ice cream lover! The original copy of the Thomas Jefferson Ice Cream Recipe is currently on display at the United States Library of Congress (see image below). It's America's oldest-known recipe for old fashioned vanilla ice cream, and the transcript is given word for word so you can follow it along. 2 bottles of good cream. -role, first putting in a stick of Vanilla. strain it thro' a towel. ice a handful of salt. shut it & replace it in the ice. -tach the ice from the sides. well down on the knee. Jefferson was shown the method of making ice cream in France around the time he penned the Thomas Jefferson Ice Cream Recipe. The early French ice creams were laboriously frozen in a covered freezing pot called a sarbotiere. These pots were often made of pewter, and they were immersed in a finely crafted wooden bucket filled with chipped ice and either saltpetre or coarse rock salt. The ice cream mixture had to be beaten by hand and poured into the sarbotiere, which then had to be agitated to freeze the cream. The method used was to hold the sarbotiere by its handle and rapidly swish it up and down in the bucket of ice water while simultaneously rotating it right and left with a strenuous wrist action that often had to be maintained for up to an hour. Not an easy process! Occasionally, the semi-frozen ice cream mixture was scraped from the sides of the sarbotiere with a houlette or what the English called a spaddle, a small spade-like spatula with a long handle, and again beaten. It was a long and difficult process, but the results tasted delicious. 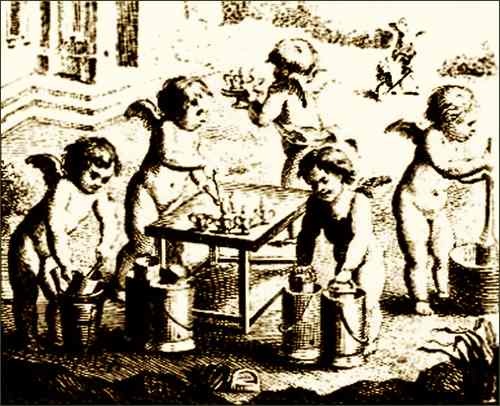 In the remarkable 18th-century woodcut above, cherubs are depicted involved in the entire process of ice cream making. They are busily bringing fruit from the garden, crushing it and preparing it for freezing, agitating the sarbotieres in their buckets to freeze the ice cream mixture, scraping the semi-frozen mixture from the sides of the sarbotiere using a houlette, and spooning the finished ice cream into ornate ice cream goblets for serving. 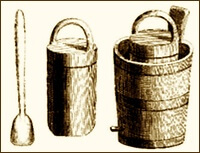 The woodcut at left illustrates a "houlette" or spaddle and a typical sarbotiere in the centre with its lid and handle. To make ice cream, you had to remove the lid and place the ice cream mixture inside the sarbotiere. You would then re-seal the sarbotiere and place it inside its "seau" or wooden ice bucket as shown, and the bucket was then filled with a mixture of ice and salt. Because of the excessive time and labor involved in making ice cream and the requirement for a year-round source of ice, for many years ice cream remained a treat reserved for well-off families with servants. Thanks to today's kitchen freezers and ice cream making appliances, you can experiment with the Thomas Jefferson Ice Cream Recipe and get to taste the same vanilla bean ice cream that President Jefferson was so fond of.